Noon - 1 -- LUNCH! Note: These are one hour blocks, as opposed to the 2 hour blocks for the Kids' program. 12 - 1 -- What Does It Mean To Be Gifted? I have largely left LiveJournal, though I am maintaining the space and prior posts. OTOH, since I haven't told anybody I have done so, I suspect you didn't know it until now! I am joshwriting at dreamwidth, just as I was at LJ. This entry was originally posted at https://joshwriting.dreamwidth.org/214087.html. Please comment there using OpenID. This is a tardy entry to the Hoagies Gifted Education Page Blog Hop because the topic is gifted underachievement and how could I possibly not have procrastinated on it?! The parents do not know their kids best, the bulk of the time. The schools do not know the students best, the bulk of the time. The kids do not know themselves best, the bulk of the time. We mostly do not know these kids and neither do they usually know themselves. Sometimes the profile is familiar to a parent, because it fit them or one of their relatives, but that doesn’t mean that anybody figured out how to help that other person and it also doesn’t mean that what the parent thinks they needed is what the child or teen needs. The schools have been failing underachievers of all stripes for as long as we’ve had schools. See below for more on that. And if the youngster knew what was going on for them, their lives would be so much easier! Often they can identify a piece of it or maybe two, but it isn’t as simple as just getting more challenging work – or certainly not by the time that the dreaded underachiever label has been plastered on their forehead. A. Following the teachers’ advice on how to deal with the situation seldom makes things better. B. Following the guidance counselor’s advice on how to deal with the situation seldom makes things better. C.	Following a psychologist’s or therapist’s advice on how to deal with the situation seldom makes things better. D.	Following a book’s advice on how to deal with the situation seldom makes things better. Why not? Because teachers, guidance counselors, therapists, and psychologists have somewhere between zero and very little training in giftedness and their training in underachievement is weaker than that. They mostly are relying on word-of-mouth and instinct, and neither of those will cut it for either population, let alone the combination. And stupidly enough, even when confronted with a gifted underachiever, they don’t go out and do the research that might inform them! They don’t. That’s pretty comprehensive, especially for 1939. Add to it racial and ethnic complications, poverty issues, and undiagnosed/misdiagnosed disabilities/differences of one sort of another, and you’ve just about got them all, though probably not quite. Eighty years later, we are no closer to an answer to that conjecture. That means that whether you learn that there are 3, 4, of 5 types of gifted underachievers or what the six steps you must take to meet the needs of your underachiever will be, you are still almost certainly going to be behind the 8-ball, playing catch-up to a problem you wish you had seen coming. Research tells us that sometimes it is a fit between the child and the teacher. But we also have learned that sometimes it isn’t – and we don’t know the percentages of which is which! Research tells us that sometimes a parenting style is a contributing factor. But we don’t then know why it was a problem for child X, but not Y or Z in the same family! This suggests that it is not simply the parenting style or, possibly, the parenting style at all! There is very little replication of research with regard to gifted underachievers or underachievers at all, for that matter. This has been a constant complaint since at least 1965, but it isn’t as if Williamson wasn’t aware of the problem: “Additional studies must be made for each school and college to determine the amount of discrepancy for each school.” You and I both know that was never going to happen, but he couldn’t see how an individual school would otherwise know what kind of gap was indicative of a problem. Thanks a bunch, Josh. Now what should be do? Don’t blame your kid. There is a pretty good chance that if succeeding academically were a matter of volition, you would have a child who was succeeding academically. Don’t blame the school or yourselves at this point, either. You lack data – and when you get the data, if you get the data, still don’t blame them or yourselves! Blame will not help make things better. Talk to your child and the teacher(s) to see what kind of gap you are discussing. See what the teacher’s perception of the problem is. See what your child’s perception of the problem is. Listen. There are books that have half a clue on the topic, depending on whether there is a learning disability (or some such) or not. The last books I liked a lot on gifted underachievers (sans LD issues) are from 1980 (Rand Whitmore) and 1991 (Supplee). The last book I liked (okay, the only book so far) on physically disabled gifted was 1983 (Maker and Rand Whitmore), though I am working on one almost as we speak. Other than that, I wouldn’t bother. They talk about the importance of having teachers whom the underachieving students feel respect them, among other things. Dr. Donna Ford has some books out for you to consider if it seems to be related to racial, ethnic, or multi-cultural issues in or out of the school. Don’t just put the kid in harder courses unless you are ready for floundering. If they have not learned to work, then things that are challenging are almost certain to just make for frustration and an even greater disbelief in self. Beyond that, I am not going to give you advice. Because of that long list of potential causes, you are going to need to figure it out or get help to figure it out – but pick your help carefully, please! https://philobiblius.dreamwidth.org/9270.html - from The High School Failures (1919). https://philobiblius.dreamwidth.org/13416.html - A quote from H.H. Goddard in 1924.
https://philobiblius.dreamwidth.org/1152.html - from The Need for Special Education of Gifted Children in White House Conference on Child Health and Protection (1930). https://philobiblius.dreamwidth.org/2394.html - 1940 research showing that “The fewer American (born) grandparents a pupil has, the higher his achievement ratio is likely to be." https://philobiblius.dreamwidth.org/1357.html - A Note on the Definition of Underachievement, Milton Kornrich, in Underachievement by Milton Kornrich (ed), 1965.
http://www.joshshaine.com/insideout.html - Underachievement from the Inside Out, Josh Shaine (1999). http://www.joshshaine.com/Interests/potential.html - From Overt Behavior to Developing Potential: The Gifted Underachiever, Josh Shaine (1999). http://www.academia.edu/3769738/Underachieving_Gifted_and_Talented_Students_-_A_Narrative_Overview - Josh Shaine (2010). This is an academic paper, for all that it is written in a narrative format. 1. Williamson, E. G. 1900-1979. (1939). How to counsel students: a manual of techniques for clinical counselors. New York: McGraw-Hill book company, inc.. This is a tardy entry to the Hoagies Gifted Pages Blog Hop! In 2009, as part of an internet meme of sorts, I listed "15 books in 15 minutes." I think I listed 18, with two at #14 and three at #15. This is about the three at #15. When I was 16, I had the great good fortune to travel to Europe for the summer, first with a group of other high school students, then with two different groups of adults with some transition time on my own, before rejoining the first group. While I was in one airport or another, I picked up two science fiction novels - British Penguin editions of John Brunner's TelepathistThe Long Result. Telepathist tells the story of Gerald Howson, from birth through age 20, and on into his professional life from there. Brunner constructs a world believably reached from where we are in which the safety of Gerald's mother's world is turned on its head by the effects of terrorism coming where nobody expected it would, and their dealing with the invasion, such as it is, of peacekeepers. Among the peacekeepers is a legendary telepathist. Her presence is brief, but it gives us a glimpse into the world of one sort of professional mind-reader. Gerald was born with a number of defects, any of which might have been a burden but all of which combine to make his life very difficult. Nor is his mother any too supportive, while dad is not in the picture at all (and we learn why not). All he really wants, he thinks, is to matter - being noticed and noteworthy, even on a small scale. At age 20, his life changes and then changes again. He realizes he is a telepath, though the only things he knows about that are from movies he has watched. And he has a distrust of the government... But he finds somebody who he thinks he can help and he does so, to the best of his ability. Unfortunately for him, his lack of understanding of his abilities draws him to the government's attention, anyway, and they take him away. But this is not a dystopian world, even though it seemed so to him as a youth - The government forces are not the bad guys in this tale! They treat his wounds and weaknesses as well as they can, though it doesn't change his underlying conditions. They offer training in how to use his powers. He is... resistant and distrustful. In his hypervigilance, he "listens in" on a difficult situation and he is moved to act. With his acting, he understands bunches of lessons in short order, lessons that spoke to me then and speak to me now - part of what prompts my writing this. This entry was originally posted at https://joshwriting.dreamwidth.org/213848.html. Please comment there using OpenID. All comments are screened. Anonymous posts are permitted (but not required). IP addresses are off. 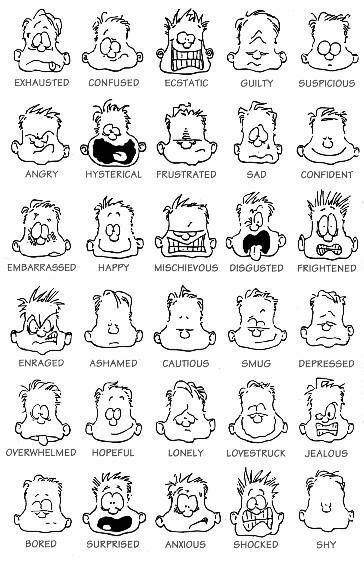 But many of us are aware of experiencing many more emotions than those charts - even those with many more faces. Hence the effort to take advantage of the hexadecimal color system to provide greater variety and gradation of emotional expression. The way that hexadecimal colors work: each digit has 16 possible values, going from 0-9 with a-f added on the end to count as 10-15. The first two digits of the number represent the brightness of red, f being the brightest, 0 the darkest. the second two are for green, and the last two are for blue. In this system the first two digits (those representing red) stand in for physical excitement; with 0 being a very slow, and f being high on adrenaline. The second two digits (those representing green) standing in for mental excitement, or the amount of noise and thought going on in ones head. A 0 here would mean it is very hard to think, while a f would mean the thoughts are tumbling on top of each other too fast to keep track of. The last two digits (those representing blue) stand in for pain vs pleasure. a 0 here is very painful, and an f very pleasurable. This gives a way of categorizing emotions using color. for instance: When all are at their highest value (the most physically and mentally excited, and pleasurable), we get white; while the lowest values on all three would show black. As this is very much an idea that is early in its development, it would be very helpful if you would use the charts above and the Hexadecimal Color Chooser to provide the colors that would represent those emotions to you and then either post them anonymously below or send them along to kindgrove@gmail.com. Our intention is to use the information provided to us to develop a better guideline for using the color selector or other system for expressing one's own emotions. We will not use anybody's name or identifying information without advance permission nor do we anticipate doing so with permission. This entry was originally posted at http://joshwriting.dreamwidth.org/213341.html. Please comment there using OpenID. The following questions are aimed at those who have a high sensitivity to others’ emotions, whether they use that sensitivity in any professional way or not. All answers on this page will be kept anonymous unless you expressly wish them not to be. Comments are all screened such that only I can read them, but in addition, if you want to comment anonymously that is an available option. LiveJournal and Dreamwidth sometimes record your IP, but I think I have turned it off for both venues. This information is going to be used by me in presentations I do and in work I do with adolescents and adults. While there is no immediate plan to formally publish it in any medium, I imagine that at some point I might, depending on (a) whether I actually learn anything worth sharing in that fashion and (b) getting out of my own way! Please direct any inquiries to me: Josh Shaine, josh_shaine@yahoo.com. 1. Was there a point in your life at which you either developed or suddenly discovered that you had a high degree of sensitivity to other people’s emotions or have you had it as long as you can remember? 2. Do you remember becoming aware of this being something you did and others did not do? If so, do you know how old you were when you had that realization? 3. Did you (do you) find yourself feeling overwhelmed by too much emotional input when you are in a group or a crowd, whether or not they are directly interacting with you? If so, what have you tried to do about it and has any of it worked for you? Are there particular situations or settings in which the overwhelmed feeling is likelier/likeliest to occur? 4. When you are working with an individual (regardless of whether this is in a professional capacity), do you intentionally seek to be more sensitive, to dive deeper or get a broader sense? If so, do you know how you did it and if it worked? 5. If it did work, have you ever tried that technique in reverse to be less attuned to others’ feelings? Did that work? 6. Have you experienced burnout as a result of your emotional sensitivity, whether or not you had been intentionally using it? If so, have you found an effective way to deal with those burnout feelings? What have you tried and what has worked? 7. Have you talked with any others about your sensitivity to others’ emotions? How did that go? 8. Are there any questions you think I should have asked you? If so, what question and what would be your answer? By the way, I have moved over to Dreamwidth, where I am still joshwriting. I will be maintaining this space for the foreseeable future, but largely new posts will appear there and apparently may or may not make it over here, as the auto-repost did not work this time around. The Story for Tell a Fairy Tale Day, 2017! Once upon a time, there was a marit (a kind of djinn) named Ginny. She lived in Manhattan with her partner, Mirabel, but that is a story for another time. Today, she was wandering downtown to pick up a gift for her great-granddaughter when she noticed a distraught man who was sitting on the ground and rubbing a lamp with all his energy and concentration. It wasn’t even one of those lamps like you would see in Aladdin. It was a small oil lamp for a table or camping out, but quite obviously the man was rubbing it with a purpose. Her curiosity piqued, she stepped right in front of him, towering over him and his lamp. “Did you have any particular wishes in mind that I might be able to help you with?” she inquired. Of course, he was stunned, because while he had been desperately rubbing the lamp, he did not expect to actually have anything happen. “I’m George. And yeah, I’m probably a bit dehydrated on top of everything.” He stood up and the two started walking down 5th Ave.
“How about there?” she suggested, pointing to a fenced in seating area. The hostess seated them and as soon as they placed their orders, Ginny directed him to tell her everything. “I’m the president of a small credit union. Today one of my employees was taking a deposit down to where we keep our reserves and somehow between taking it from our counting room and the entrance to the other bank, it disappeared. He blushed, but he also nodded. The credit union proved to be only a couple blocks away and Uncle Billy was waiting there, pacing back and forth and ringing his hat in his hands repeatedly. They took seats in the small conference room, with George explaining that she was a private detective and was there to help. Billy accepted it without a second thought. Ginny pulled out a pad and pen and started with basics: Who, what, when, where, how, and why. Who? Billy. The employees. Finally, George. When? Left the counting room at 9:15am. Got to the bank at 9:37am. Got back to the counting room at 10:52. Talked to all the employees. Told George at 11:15. Where? Not yet determined, but almost certainly between those locations. Ginny walked over to the ceramics shop, where the proprietor was sitting at a low desk, painstakingly detailing a ewer. She identified herself, showed him her private detective’s ID, and he interrupted. “Sure – I will pass the order along shortly. Thanks I think I know just the thing.” She grinned. She made her way back to the credit union and was let into the conference room. She dropped the satchel on the table. Billy coughed and then laughed and finally got himself together and left Ginny and George together. “Ask her if she ever annoyed a genie or made a silly wish, would you? Way too many coincidences in this one!” With that, she took her leave, stopping only to place an order for herself with the potter. There is no way that I will even thoroughly cover the topics I already have - but I imagine I will be teaching this again! Course description as well as outline are at the link. Click here for the course description and outline. I don't do regret, as a general rule. It doesn't mean that there are not things that I wish I had done differently, 'merely' that I try to learn from them and move on, aiming to do better next time. Sometimes, though, even that is not quite enough. My mother wrote. She wrote children's books, novels, poetry, and various bits of non-fiction. The novels were not particularly good, I suppose. The children's books were pleasant enough, if not stuff that will live in the literature forever. The poetry was pretty good, but it is a tough field in which to be merely pretty good. Some of the non-fiction is still kicking about - if nothing else, as testimony she gave concerning parental leave. She knew that I wrote, though what she saw of my writing was the non-fiction about gifted education, underachievement, and Dabrowski. I did not start writing fiction until she was in her last years, mostly past ability to appreciate it. She did not get to see Romeo and Ethel, the Pirate's Daughter - a work she would have enjoyed quite a bit. With the exception of the beginning Tales of the Teddy Bear Forest, my fairy tale writing came after her passing. And I wish, from time to time, that I could share them with her, both for her editing and her pleasure. I think it would have tickled her that I've become a writer, if not yet either persistent or prolific. NOTE: This is the 2nd chapter. The first chapter can be found here. Sarai smiled every time she thought about the group’s name: Mining Minds for Mending Minds. They usually just called themselves 4M. As a young counselor, she really appreciated getting to participate in the collegial process of batting around one another’s difficult cases to try to find fresh approaches to them. Mostly she tended to remain quiet, mostly listening as she was unsure that she had much to offer them, at least not yet. She’d been told this was a pretty common approach to the first year or so in the group, for which she was grateful. In honor of my 60th birthday (which will be next November 12th), I am going to try to write 60 stories and/or chapters between now and then (with some slush days if I need them through the end of the 2016 calendar year). If it is not for you, personally, then let me know for whom it is being written and preferably age and gender, as well as preferred theme/topic/genre. Age/gender can be in a private message rather than a post. I prefer one per person/family. If you want more, mention that, too. I *can* do one for a family or a group. Unlike last time I did something like this (with 11 stories in a year), there is no need for participants to create 10 things for others, though if you did that would be very cool! For almost 25 years I have been hearing and reading about gifted kids and Overexcitabilities (OEs). Dr. Linda Silverman provided my first view of them at a conference run by the Hollingworth Center for Highly Gifted Children, then my second view of them in her (wonderful) book, Counseling the Gifted and Talented (Love Publishing, 1991). The thing is that both of those presented me with the OEs but also with Dynamisms, Factors, and Levels, all parts of Dr. Kazimierz Dabrowski’s Theory of Positive Disintegration (TPD). These days, as I read articles on Overexcitabilities, it’s a fortunate event when Dabrowski is mentioned and a pleasant surprise to see TPD mentioned even in passing. Dynamisms, Factors, and Levels do not show up at all and there is very rarely an intimation as to what is being disintegrated, why it might be disintegrated, and what the OEs have to do with any of it! Having a label for the twitching and bobbing, the sensitivities, the endless questions, the wild stories, the melt downs over seemingly trivial issues or unmanageably large issues, provides a degree of calm for at least a moment and a language for discussing these bits with other people where before it was almost always pure defensiveness. An honest–to-god theory that talks about this stuff?! Hooray! Unfortunately, the purveyors of Overexcitability information are largely doing you a disservice, in my opinion, by perhaps giving just a link to more information or, more often, not. There is so much more to the OEs than that first blush would suggest! Before Dabrowski called it overexcitability he called it hyperstimulatability and then nervousness. The Polish word that Dr. Dabrowski used for this set of traits, nadpobudliwość, is now one of the translations for Attention Deficit Hyperactivity Disorder. Just as it is the first part of TPD to catch most people’s eyes, it was the first to catch Dabrowski’s attention. One specific purpose, at lower levels, is to create conflict in one’s world. The stronger the OE the greater the chance and degree of disruption and, as Cait pointed out, Dabrowski was a great believer in the “no pain, no gain” school of thought. Where there is an individual with more than one OE, there is an individual whose OEs do not exist in isolation from each other. For example, children with both imaginational and emotional OEs might be distraught on behalf of the last leaf of a tree, feeling its loneliness and fear deep in their being. With the Intellectual OE seems to travel a ‘sense of justice,’ that looks at unfairness beyond how it might serve or offend one's personal needs. There were times when Dabrowski felt a client’s Overexcitabilities might indicate the need for medication and/or psychotherapy. Dabrowski believed that the development of inhibition of expression of the Overexcitabilities was appropriate and necessary for development of Personality. I noted above both the conflict function and that there are other uses for OEs according to the Theory of Positive Disintegration. One example of that is Psychomotor, which provides the energy and impetus for growth. Without that energy, a traumatic, potentially transformative experience is likely to result in an individual’s settling back into a familiar life, rather than disintegrating. Primary Integration: No sense of alternative world views, no sense of hierarchies of values. A substantial number of Level 1 individuals are about self-aggrandizement. No internal conflict, just external. Unilevel Disintegration: Recognition of alternative world views, but still no hierarchization. (Hence unilevel.) Dabrowski represents Level II as very unstable for the majority of people there. Internal conflict and external conflict as well. Spontaneous Multi-level Disintegration: The realization that some values are higher than others, with the nearly crippling conviction that they are unattainable. Predominantly internal conflict, increasingly so as one develops. Organized Multi-level Disintegration: Generally living without much external conflict, but usually an ongoing drive to grow. Living far more closely in accordance to one’s ideals. Secondary Integration: Personality Ideal; living for the purpose of making the world a better place. Self-promotion is no longer a valid self-concept or goal. It’s all well and good to list these as if they are clear, distinct ways of being, but one can have a foot in more than one. And even the concept of “being in one” is not really valid because one progresses within each of these, as if there were dozens of steps along the way, even though they are not commonly identified as such in Dabrowski’s works, with the exception of Level 1 for which there is a beginning exploration of the shades of “oneness” one might have gone through or at least which one can identify. The chances of going past Level 1 or Level II (which seem to have 60-80% of the folks) depend on “Developmental Potential,” again as Cait noted. The more and the stronger the OEs, the more likely there will be progress. But no Psychomotor means reduced chance of development from lower levels. First Factor is one’s genetic component. A strong first factor is important. A weak one may be impossible to overcome. Second Factor is environmental. More feasible to overcome a weak Second Factor, but it is hard. Third Factor is autonomous drive – to this author’s mind, one of the most poorly defined elements, but dealing with the internal push toward self-perfection. OEs (remember them) change in manifestation as one develops, shifting from running an individual’s life to providing some background richness. Where Psychomotor was vital before, the others become far more important for development. Everything else in life changes, too, as one becomes less caught up in the regular human/rat race – and the theory includes explanations of just what those look like along the way. Yes, there is such a thing as Negative Disintegration. No, no explanation tonight! Along the way, as you look at yourselves or your kids, keep an eye out for Positive Maladjustment – when you go against your immediate community or group because what they are doing feels wrong to you. The opposite, negative adjustment, is when you go along to get along, even though what is being done is hurtful and/or inappropriate. Some of Dabrowski’s material is available currently, though not a lot of it. More is on its way, however! To get more of my sense of Dabrowski and the Theory of Positive Disintegration, check out either of these links: From overt behavior to developing potential: The gifted underachiever was written in the 1990’s and reflects my first real exploration of the OEs in application. Dabrowski's Theory of Positive Disintegration - A Narrative Overview was written in 2010 and is a more comprehensive look at TPD. This blog article is part of the Hoagies’ Gifted Education Page Blog Hop on Overexcitabilities. I thank my friends at Hoagies’ Gifted Education Page and elsewhere for their inspiration, support, and suggestions. In particular, I would like to thank Linda Silverman, Cheryl Ackerman, Bill Tillier, Patti Rae Miliotis, Leslie Forstadt, and always Susan Shaine for their parts in this journey into Dabrowski. Two women walked along a rutted road between a couple villages, Mirabel and Jinny. Their destination was not particularly important to them on this occasion, so there was neither hurry nor purpose in their steps. They seemed as if they were almost yoked together as a team, so in step was their progress. But one of them was quite focused on the world around them, while the other seemed distracted. Mirabel is a human, while her companion is a marit – a kind of djinn. The story of their meeting is told elsewhere. They’d been trying to understand the world of humans for a long time – for about as long as humans had been stumbling around in the forests and streams and meadows and mountains. Dryads, naiads, sylphs… it didn’t matter which of the fey folks to whom you spoke, the eventually the question came up: how is it that humans use reason rather than intuition? You knew what you were supposed to do and when and how you were supposed to do it when the circumstance came up. None of this careful planning, measuring, calculating stuff of which the humans seemed so fond – or without which the humans seemed so lost! Sometimes they would hide one of their tools just to watch them as they at first floundered, but then found other ways to recreate the kind of measuring device they’d planned on using to start with. It could delay them hours or even days to be so deprived and their initial reactions were often so flailing that it was hard to stay out of their way, but ultimately most of them could discover another means to their ends. Jinny had wondered this, if not so clearly, for several hundred years before she become friends with Mirabel. Friends! Just thinking the word brought a broad grin to the marit’s face and a bounce to her step – not that her step needed much bounce the bulk of the time, as floating was easier when they were alone. “What mischief are you up to this time, Jinny?” The voice conveyed a tone of mild annoyance, but Jinny knew better. She laughed. Of course she knew better! Mirabel’s wish to be understood had been open-ended, if not consciously so. "I wish you could understand my point of view!" And so she did and so she does. It was Mirabel’s turn to laugh. “I’m pretty sure that we have settled that whole wishing thing once and for all already – but even if we hadn’t, this would not be the sort of thing to spend… to waste a wish upon. Besides, if you don’t give me broad hints like that, this relationship would be far too imbalanced. “So? What mischief? !” She plopped herself down under a tree by the side of the road they were traveling along and Jinny joined her. “This time around, I am thinking of the entire world of magic critters. … Oh, right – we haven’t talked about those before, have we? I’m sorry! Would you prefer the slow or… okay, the hard and fast version it is. Mirabel’s eyes bulged. This was a bit much for her to swallow quickly and easily, no matter how practical she was – or because she was so practical, perhaps. “There are two different things that go into that question. Your implication is one of a deductive process. We don’t do that. When we consider how they might come into being, it is more a wondering if there is a natural process that might occur which would produce such an outcome. This is purely conjecture, as our reasoning is not well suited to… well, reasoning! “Hmm… give me a minute to process. And do we have any food left in our bags?” Jinny opened up a sack and pulled out a pair of sandwiches and a bottle to share, with a wink to Mirabel’s raised eyebrow. “And that brings us back full circle to my mischievous thought! How might I introduce deductive reasoning or even mathematical reasoning to a people who do not naturally do such things? And in contrast with my general magical intuition, I have neither an instant answer nor a conviction that such a thing is beyond me. This suggests that while there may be a solution, it is not a magic-based response to the problem. “By the way, have I told you what a grand time I am having being able to work through all this this way? It’s so much fun!” The two of them fell together laughing joyfully. The two finished their meal and resumed their journey. They banged ideas around for a while. As they talked, it became clearer to Mirabel that even with her reasoning ability Jinny had no real notion of how her population had gotten to be who they were, what the process might have been. To Mirabel, though, it seemed sort of obvious once the question was examined – it was organic. There was no planned progression, just a set of steps that happened and were then done. No conscious intention to expand locales or cross rivers until a need came upon them. So, the very idea of intentionally introducing a skill to the fey was beyond them! As ever, with Mirabel’s thoughts came Jinny’s comprehension. (“And was that convenient!” thought Mirabel.) “So, if we introduce something that is at the very beginning of the idea of reasoning, that might allow it over time to develop into full deductive and inductive thought!” Jinny did a little jig in the road. The following was written from a writing prompt of my own, as part of an offer I made on Jan 17, 2014. This story is for Lydia Brown. Sthey woke up ready to start stheir day. Okay, sthey woke up ready to go through the steps involved in starting stheir day. At 107 years old, it took a bit more effort to put all the pieces together than at some points in the past. Two thoughts, almost simultaneous, crossed stheir mind. The first was stheir annoyance at the aches and pains of stheir body as sthey got sthemself ready. The second was mild annoyance at stheir ableist self-reflection. The pair of them brought a smile from stheir at the familiar exchange. Grudgingly, sthey granted that perhaps today was not quite the same as every other day. While sthey had had stheir share of honors and awards in stheir life, today’s ceremony held special significance for stheir above those. Today was about stheir protégé, not about stheir! Sthey’d always liked Geneva in the spring time, with the trees blossoming by the lake and the smell of delicious baked goods wafting through the air. Sthey was gently escorted down to the front row of the auditorium, resisting the voices that urged stheir to use a hover chair. Sthey didn’t object to using them when sthey felt the need, but neither was sthey going to take one when sthey did not. Sthey nodded off while waiting for the session to get started, awakening with a bit of a start before realizing where sthey was. It was okay – nobody criticizes 107 year olds for nodding off (except sometimes sthemselves). Folks were beginning to assemble on stage. Sthey listened respectfully, if not always attentively, to the political leaders. Finally, they got to the point. We are here to honor the life, the work, and the being of a person who has made it possible for every person on the planet to be acknowledged for who they are, regardless of what some past societies might have declared them to be. Stheir relentless efforts, despite all the obstacles the world’s governments and sticks-in-the-mud have created, proved enough to change the world – inspiring us with both the focus sthey brought to the work and also the joy sthey expressed along the way. From adoption of a world-wide convention on singular, non-gender terminology to codification of the legal and moral requirement for our society to meet the needs of each of us as those needs come along, sthey have helped us to establish a standard of humane treatment of humans for the first time. Please join me in welcoming the recipient of the Century Award for Excellence in World-Changing, M. Tügkülen. Tügkülen came out to center stage to thunderous applause, whistles, stomping, and a host of other noises that symbolized the appreciation of folks from around the globe. I would like to start by simply noting an enduring truth of my life and my story. I would not be here with you today but for the teaching, guidance, and support of my mentor, who is seated in the front row. Out of respect for sthem, just a nod of acknowledgement will be enough and more than enough. Sthey acted as I have come to act, out of necessity rather than out of self-promotion. Sthey paused a moment, nodding sthemself to the guest in the front row, before continuing. And I would like to finish, perhaps even more simply. And with that, Tügkülen walked off the stage, down front, to give stheir friend a hug. And with that, the two of them stood up and left the hall, because there was work to be done. The following was written from a writing prompt of my own, as part of an offer I made on Jan 17, 2014. This story is for Shannon Reilley. It was dark in his room, a short while after the last client of the day had left. The shades were down, blocking what little light might have come in from the street on a moonless night. He was sitting in his chair – a stressless recliner that also swiveled, though he was not very reclined in it just this moment. He was poised to write down some notes, but he put his pen down and chose to stop and think a while more. His last client of the day was very complex. This was not terribly unusual, as many of his clients were complex, but that did not mean that he understood their situations with equal facility. With her it had been a very long 6 years to this point, when normally he would see clients for 3 to 6 months and sometimes less. Tonight had not felt like the prior sessions had, as far as he could tell, but putting the finger on exactly what made it different was not yet happening. He went through what they’d said, trying to squeeze out her exact phrasing, as well as his impressions at the time. Certainly one different aspect was their discussing a time in her life that they had never explored previously – how she had chosen her profession. For all that this is regularly a prime topic for consideration, she’d never been willing before, let alone open. Or somewhat open, he admitted. He spent some more time in silent contemplation. Finally, he decided he knew what had happened. He stood up and felt the way to his supply closet. The following was written from a writing prompt of my own, as part of an offer I made on Jan 17, 2014. This story is for Jen Heater. They were out together in the morning ground fog, attired in orange vests and hats, as they had been at this time of year for longer than either of them could remember. It was deer season and they were quite intent on meeting their quota this year. It didn’t really matter to them that they could not eat all of their kill themselves – somebody would eat it, they were sure. The hills and paths were so familiar, as if they had gone down them a thousand times or more. It was one of their favorite parts of this neck of the woods – nothing ever seemed to change. They took that as proof that the hunting permit process was not overdoing it. They took the winding path down beside the stream to their artificial blind. They were surprised to find a couple other men already there, dressed in somewhat oddly styled clothing, though still in orange. The trespassers had only cameras, no rifles. Because the goal was to be quiet, so as to avoid startling the deer, rather than calling out they continued down the path to the blind. By the time they got there the other men had moved elsewhere. This was more than fine with them! They hunched behind the rocks, sitting on a pair of conveniently placed stumps and waited. Smugly, one observed that they must be getting better at bundling up, because despite the obvious chill in the air, their extremities were not really even feeling cold. The wait was longer than they expected, but they were pretty sure they would be rewarded for their patience. The rumor they’d heard at one point was that there was a 12 point buck in these woods and neither could remember anybody’s bragging that they had nailed it. They were mostly silent, looking outward from their rock. After more than a little while, one of them – they could never agree on which it had been – motioned to the northeast. There, much to their amazement, was an incredible white tail buck. His antler spread must have been at least 40 and quite possibly 50 – he was not holding still and it made it harder to count. After they shut their mouths, they went about making sure they could shoot him cleanly. Off to their left, a small noise briefly caught the beast’s attention and theirs as well. It was the other hunters, but their target seemed to be over the west ridge. Soon everybody had settled back down. They would take turns, the 2nd shooter only firing if the first missed for some reason or did not get a clean hit. Tense. Waiting. Gently squeezing the trigger and a loud noise! The buck, untouched, ran off to the side a bit, but not far. The other shot his gun, less than 20 feet away, but the buck was still untouched. It did run off and seemed to fade into the mist that had gathered in the gully. More than a little perturbed, they went to track it, only to see no tracks. A shudder. “Ya’ suppose that’s the ghost of a great buck, rather than a live one?” “Couldn’t say, but I sure have no good explanation for it!” They started back to the blind. The two men, in their stylish outfits, came back to the blind after a few hours of fruitless hunting. The following was written from a writing prompt of my own, as part of an offer I made on Jan 17, 2014. This story is for Kim Roche. He was my grandmother’s sister’s grandson and as such family. We were required to be nice to family, even when the family member in question was not nice. Ren, as he liked to be called, was anything but nice. It was easy as kids to make excuses for him or to believe the excuses that others made for him, despite the frequency with which those excuses needed to be made. Yeah, he cheated at games, and sure, he would sometimes take stuff that didn’t belong to him – even stuff he had no interest in, but which he took anyway because it was there. It wasn’t malice, or at least it wasn’t initially malice. Often it was habit or impulse. That was how it seemed, at least, and I have no reason to be sure it was otherwise even now. Ren was a bit less than a year older than I was, in the same grade for a while, then one grade behind me when I skipped and then two when he was kept back for missing too much school. From my perspective, this was pretty dumb – Ren knew as much as I did academically and far more in a variety of other areas, if not quite as much in others still. His being a grade behind made sense if his school would not skip him, but two behind? No sense at all. I think it was after he was kept back that he started really resenting me and he turned mean and, in hindsight, creepy. Even when he was being mean, I could deal with him on my own. I could pick on him far worse than he could pick on me – his weaknesses were more glaring than mine and he more vulnerable to them. I knew when he took my stuff and could make him give it back without invoking the power of my parents or his, let alone one generation further back – even when you were in the right, you did not want the attention of the grandparents! But the night he showed up in my bed required more than I could handle on my own. It required a reset. He was my grandmother’s sister’s grandson and as such family. We were required to be nice to family, even when the family member in question was not nice. Ren, as he liked to be called, was too sad to be called nice. It was easy as kids to make excuses for him or to believe the excuses that others made for him, despite the frequency with which those excuses needed to be made. Yeah, he cried at the drop of a hat, and sure, he would sometimes take off in the middle of a game or activity – even those he was really interested in, but which he left anyway just because. It wasn’t dislike of me, or at least it wasn’t initially dislike. Often it was misery or impulse. That was how it seemed, at least, and I have no reason to be sure it was otherwise even now. I think it was after he was kept back that he started really resenting life and he turned depressive and, in hindsight, suicidal. Even when he was being depressed, I could deal with him on my own. I could support him far more than he could resist me – his vulnerabilities were glaring to me and he was more susceptible to my words. I knew when he was hiding and could help him rejoin us without invoking the power of my parents or his, let alone one generation further back – even when you were in the right, you did not want the attention of the grandparents! But the night he tried to kill himself required more than I could handle on my own. It required a reset. The thing about a reset is that only the person who does it knows that it was done, let alone why. Ordinarily, the only people allowed to do resets are the elders, but when it is nearing time for an elder to step down or move on, they choose a successor. My grandmother chose me and as such I had to do Ren’s resets. I talked with her about the two life paths that Ren had been on, because I was not sure how I could do a reset that would have any better results than the first two paths. She mulled it over for a couple days, talked to my parents a bit and then with me, and then worked with me to shape the reset, even though she insisted that I still perform it. He was my grandmother’s sister’s grandson and as such family. We were required to be nice to family, even when the family member in question was not nice. Ren’s parents were anything but nice. It was easy to see why Ren was sometimes very poorly behaved and other times quite sad. Yeah, he cheated at games, and sure, he would sometimes take stuff that didn’t belong to him – even stuff he had no interest in, but which he took anyway because it was there. And yeah, he cried at the drop of a hat, and sure, he would sometimes take off in the middle of a game or activity – even those he was really interested in, but which he left anyway just because. Ren was a bit less than a year older than I was, in the same grade for a while, then one grade behind me when I skipped. The school recommended keeping him back for missing too much school. From my perspective, this was pretty dumb – Ren knew as much as I did academically and far more in a variety of other areas, if not quite as much in others still. His being a grade behind made sense if his school would not skip him, but two behind? No sense at all. I think it was when his parents tentatively agreed to it that he started really resenting me and he turned mean and depressed, both. Even when he had been acting out, either against others or against himself, I had been able to cope with it without invoking the power of my parents or his, let alone one generation further back – even when you were in the right, generally speaking you did not want the attention of the grandparents! But their plan to have him kept back required more than I could handle on my own. I turned first to my parents and then to both sets of grandparents. The grandparents intervened. I think it was when my parents took him in and assured him that he would not be kept back that he started to be able to relax. He didn’t stop being mean or depressed immediately, but it came with time and support and unconditional love – theirs in addition to mine. The relationship shifted over the next few years, as his self-confidence grew. The year I applied to colleges he did too, as a junior. We chose to go to the same one, best friends then and now, many years later. The following was written from a writing prompt of my own, as part of an offer I made on Jan 17, 2014. This story is for LJ Waugh. Ever since Halfmann’s team at Darmstadt managed to freeze light for a full minute, preserving images at the same time, Sean’s team at the Bates Linear Accelerator had been trying to duplicate and then improve upon that performance. In the intervening 18 months, they’d tried a bunch of approaches, none of which had quite caught up to Halfmann, let alone improve upon it. Sean had an idea to try this morning that was a tad off their normal path, but nobody else had scheduled a live demo for the morning, so it seemed like a good time for a fishing expedition. The praseodymium ions were already arranged, as well as the crystal and the lasers. Sean couldn’t help but think of the New Age aspects of using the crystal to stop light, but it was just a passing fancy. “We are serious scientists” was the thought, voiced internally in as stuffy a manner as possible, followed by an external laugh. Next, the dampening fields. Sean set up a third laser, a red one, seeking to try to freeze two bits of light at the same time. Just as Sean was readjusting the crystal to make sure it was angled right for the third laser, a clatter came from the control panel and abruptly all three lasers came on. Sean gave first a startled sound of fright and then almost immediately one of amazement. No response. No congratulations, no outcries, nothing. Sean looked up and then looked around. The light was frozen, but so were all the people. Sean removed the crystal and people started moving again, but they still weren’t responding to anything but the mess at the control panel. A quick call confirmed that Sean was not there, which Sean already knew and knew quite well. And as the moments turned to minute, there was an increasing feeling of dissolution. Minutes turned to days turned to weeks. Sean retained consciousness of a sort, but it took quite a while before enough focus returned to give even the sense of a corporeal form. Slowly, Sean drifted toward the home, in the hopes of finding more personal focus, arriving to find “More Than Meets The Eye” sitting ironically on the stand next to the drawing board. Sean shared the apartment with an artist. As surely as the apartment, they also shared a deep love. By focusing on that love, Sean achieved an increased physical existence – not enough to speak or consistently type, yet, but enough to create breezes to perhaps catch the artist’s attention. If the physicist could do that, there would be hope of finding a way out of this predicament. Then Sean saw the tablet and for the first time since stopping the light, gave a smile. The following was written from a writing prompt of my own, partially as part of an offer I made on Jan 17, 2014. This story is for Elizabeth Margareta Griffith. In the following story, concepts are expressed in a way familiar to some cultures on Earth. This is done to permit an understanding of what is going on, but the real items in question do not, in fact, resemble the Earth artifacts that are used to symbolize them in this recreation of the foreign history. For centuries, perhaps millennia, their people had worked to eliminate emotions from their daily lives, feeling it was a burden too great to bear. They blamed emotions for all the conflict between peoples, from minor domestic squabbles to intercontinental warfare. By purging themselves of emotions, they would be free, at last, to grow as a people and rise to the heights they so deeply desired. The depth of their desire to rise was the first thing to go. It had been the most powerful of their racial urges, far stronger than the imperative to procreate. As the government officials and scientists began to notice that effect, there was some heated discussion concerning blame, but that fell rapidly by the wayside, too. No room for blame where there was no room for emotions. What would be the point? The first efforts were through personal discipline and meditation. They were quite effective for day-to-day emotional situations, but did not prove to be sufficient to overcome either the most intense of conflicts or personal weaknesses. The greedy, the power-hungry, and the narcissistic were quite good at feigning adherence to the cultural norms and training programs, while not actually buying into the approach at all. They assumed, rightly as it turned out, that there would be others resisting as well, and they were not about to give up what was “rightfully theirs” to folks who would not obey the law! After reclaiming the government from the malcontents, the people turned to their physical scientists to help them – the biologists and geneticists, and the chemists and the endocrinologists. Their goal was to get at the biological/physical roots of emotions and find a way to turn them off at the source. The work captured the imagination of the planet as well as its resources. The progress was slow, but progress there was. Through personality tests, the government determined the best test subjects for the new bio-chemical approach: the greedy, the power-hungry, and the narcissistic. It worked. It was initially stunning. The populous was ebullient. Celebrations in the street, grand award ceremonies for the discoverers, and increased action at the betting parlors over when the people would at last be free of their burdensome feelings. There was debate, but not a lot, on how best to ensure that no country had the advantage of pure reason first. A two-fold approach was necessary. Wiping out the body's enzymes that triggered emotions was easy enough, but that did nothing for the newborns, who arrived with their sentiments loudly and clearly expressed. The stumbling block that had finally been discovered was a teratogenic mixture that would wipe out the genes that produced those enzymes for both the immediate person and any offspring. Production and distribution of the chemical took place without incident, barring a few rather drunk celebrants who were not quite up to their jobs. The day before was filled with partying and parades. The day after was quiet, calm, and smooth. The collected wisdom was that they seemed to have done the right thing – but it was a matter of fact conclusion, accompanied by no smugness or gloating by those responsible. The year that followed was remarkable, or it would have been had there been anybody inclined to exclamations. Where there had been war, there was a dogged effort to clean up the mess left behind because landmines and unexploded bombs are messy and dangerous. Where there had been starvation, supplies were shipped in and distributed. No rancor, no rushes of the trucks, and no pilfering of the materials by either thieves or controlling warlords. An external observer would have wondered if they were on the same planet. The first real hint of a problem came early the next year. A major earthquake hit one of the population centers. The emergency crews wandered over to see what they could do. The news broadcasts showed images of destruction and the homeless and wounded people. But unlike years past, there was no urgency to the efforts of the fire departments or the ambulance crews. They got there when they got there, with nobody upset with them and no real motivation to hurry. Some people sent in money or spare supplies, but really there was no reason for most people to, as there was no pity for the suffering, no guilt for not doing more, and no impetus to solve the problem. For the most part, people kept working because it was convenient as was having money. The demand on the courts was pretty low, though, so some folks got laid off. The efforts of some workers remained high because there was no reason for them to do less well, but for others the drive to work hard had been based on either pride in their efforts or fear of losing their jobs and without those emotions to drive their efforts, both quantity and quality slacked off. None of this was lost on the government or on the scientists. There was a general agreement that something might need to be done about it. While one faction felt that it should be studied longer and another felt that probably something should be done sooner rather than later, neither felt passionate enough about their argument to push very hard nor even to work on it quickly. Years passed without something being done beyond studying what was happening. The infrastructure deteriorated because there were not enough folks with a personal work ethic to keep things going, nor a societal structure that could ensure that things would get fixed. But when a scientist approached the government, requesting resources for finding a cure for the emotionless society, they had no real reason to turn her down and sufficient assets to allow them to say yes. So they did. Even curiosity is an emotion, unfortunately for the world, so the number of folks for whom new ideas served as an attraction was pretty small. Why this particular woman found this particular problem to be the thing she chose to tackle is hard to say. Whim, perhaps, but is even that feasible? For whatever reason, though, this was the path she chose. It was only natural for her to have access to the research that had led to the miracle. There were no quick answers to be found, partially because she wasn’t working at a feverish pitch and partially because it was a challenging problem and would have been under any circumstances. She kept at it out of habit – she had no external motivation nor, really, any internal one, but equally no motivation to stop, so she didn’t. More years passed. Imagine, if you wish, societal decay with no hue and cry about it. Imagine, too, a woman plodding along, sometimes with help and sometimes without, examining bodies and systems and elements. While the stories could fill many chapters, they would all be largely the same. About 15 years after her request for resources, 25 years after the change, she had an idea of what might help. It was a somewhat difficult solution, though it would have been easy pre-change. A distant mountain range had a mineral that she thought would do the job, but air travel had been stopped because the maintenance was no longer sufficient to make flying safe. She traveled slowly across the country, about 1500 miles, sometimes by car and sometimes on foot. When she got where she was going, she had to find help – digging into a mountain was not something she had the skill to do on her own. She managed to find a working excavator and somebody willing to run it for her. Over the next few months, they drilled and dug. While they did not push as hard as one might have wished for, they did keep at it, and finally they got to the level she was after – a seldom used substance that simultaneously boosted the effect of sodium while reducing magnesium levels in the body. They pulled out enough of the ore to allow her to run copious experiments without a need to ration it carefully, and she returned to the capital city. It was difficult to find volunteers within the general population – it was not that people were afraid of the side effects, but they saw no particular reason to try it. Finally, she turned to the government, where a few officials were willing to serve as experimental subjects. The pace of her work continued to be deliberate, with no increase of excitement at her proximity to a possible alleviation of the symptoms of emotionlessness, but when she had seen enough to know that her current mixture would not have lasting or dire consequences on an individual who took the blend, she prepared a dose and took it herself, with no concern. “No,” she replied, “But it is important that they see me today!” A small bit of inflection added to her sentence was more than enough to gain the secretary’s acquiescence. The following was written from a writing prompt of my own, as part of an offer I made on Jan 17, 2014. This story is for Jay Piltser. Naturally. Well, “naturally” if you could say that in response to the death of a piece of electronic equipment. She hadn’t the time to address it right now, as she had work to do – she’d committed to finish a batch of art for a book, “More Than Meets The Eye,” by the end of the weekend and while it was only Saturday morning, she had more than enough to do to keep herself busy for the whole weekend. It’s not like she had anything else to keep her busy, though. She had pretty much turned off her life, outside of doing art for money, since her lover had died. She missed Sean so much… enough! Back to work. She turned to read one of the pages she was to illustrate, but with a small breeze it blew off and across the room. She retrieved it, sat back at her drafting table, and read through the page. She had a pretty good sense of where she wanted to start and turned on her oversized tablet. When she put her finger to the pad and set the color she wanted to start with, her hair blew into her eyes. “How could she have forgotten to clip her hair back? !” she said angrily to herself. A moment later, clip in place, she sat back down again to work. A few minutes later, the page she’d read drifted onto her pad, blocking her view of her work. Grateful that she was working on a tablet and not in paint, she returned the paper to the rest of the loose leaf book, then put a rock on top of it. She stopped her thought short. The AC was off! More than off. Dead. She walked over to it, just to make sure. Not only was it dead, but it was unplugged, too! She reminded herself that she just did not have time to deal with the AC. Back to work. All day long it went like that. She would get a little bit of work done, but something in the room would come loose to get in her way or distract her, even things like her hair that she knew she had clipped! And where was that breeze coming from? As evening fell, still intermittently immersed in her work, she chose not to close the curtains. She was actually making progress. Of course, as soon as she had that thought, a small thud behind her pulled her eyes away from the imagery she was creating. She soon spotted the culprit – a Japanese fan had fallen off a display shelf and landed open on the hearth. It fluttered toward her, giving her yet another of those small breezes she’d had all day. Another noise, this one familiar but wrong. The curtain was closing without her. She stared over at it and against the darkness of the outside, she could just make out a silhouette. A familiar silhouette. Sean. Sean was dead. An experiment at the particle accelerator, she’d been told. Dead. Not even a body to bury. Sean could not be closing the curtains. She looked again, but the curtains were now closed and there were no silhouettes to be seen. She knew it – she was cracking up under the stress and sadness. She sighed. Back to the drawing board, so to speak. The following was written from a writing prompt of my own, as part of an offer I made on Jan 17, 2014. This story is for Sherene Raisbeck. As they went up the stairs to the chamber adjoining the royal suite, the King continued to fret at the Wizard, but she was very patient with him – she knew the histories even better than he and she could not deny that he had cause for concern. Hundreds of proto-princesses and proto-princes had been the victims of malicious magical mayhem. Still, she was quite proud of their discovery and pleased with their implementation of it. She opened the door to the nursery and handed the King a rock. “Go ahead, throw it in.” He did, but no sooner had it gotten to the doorway but it rebounded and hit the King. “Sorry, your Highness – I forgot about that aspect. Anybody who tries to assault this room, your wife, or your child will have that effort rebound upon them immediately! That applies to physical harm or magical or even emotional! We’ve put the same safeguard on the royal carriage and the royal pram.